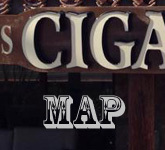 The Casa Magna Colorado cigar series is a full-bodied Nicaraguan puro blended with the best Cuban Seed Ligero and Visos from all the major growing regions in Nicaragua. The special Ligero Cuban Seed Colorado wrapper is cured in a calfrisa, which is a temperature-controlled curing barn with air circulators to ensure a beautiful oily wrapper and even color. The binders and wrappers are all selected to make a blend that is full-bodied and full-flavored without being harsh.